The official day of love is almost upon us! Personally, I think every day should be a day of love, but since I absolutely LOVE celebrating and decorating, I will take any excuse to do so. Recently, I’ve been seeing ads for chocolate covered strawberries. One of the ads has 6 dipped berries shipped to your door for only $20. What??!!?! This made me think that I needed to change jobs and become a seasonal berry dipper. I can get strawberries, chocolate and cream for under $10 and make at least 16 that are probably at least as good (if not better) than ones shipped a distance to get to you. So if you are scrambling for a last minute treat for yourself or someone you love, let me save you a few bucks and share a simple and decadent spin on chocolate covered strawberries. I have replaced melted chocolate and oil with a rich and tasty ganache, which takes an easy and tasty dessert and makes it amazing. So let’s warm some chocolate and let’s get dipping! Remove from paper (note a little chocolate will stick and that’s ok) and enjoy! 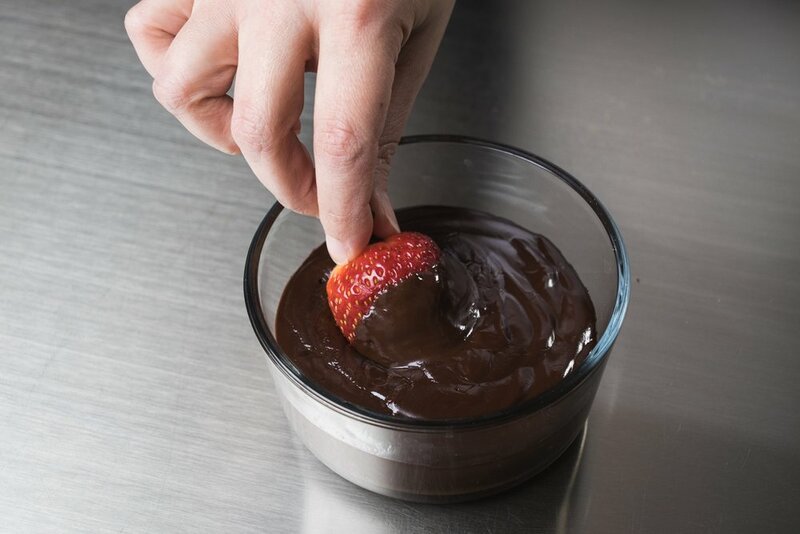 If you will be preparing the ganache the same day as the berries, add about 20 minutes of prep time to the process to allow for the preparation of the ganache. Ganache will keep in the refrigerator for about 5 days in total so any leftovers can be used as you would chocolate sauce or frosting. The berries will also last about 5 days in the refrigerator after being dipped, but good luck keeping them there for that long! February is an odd time for a recipe using strawberries, but this time of year tends to bring good sales on berries as California and Florida have almost year round berry production. Not only will you not break the bank making these, but the berries will be fairly fresh for the dead of winter too.